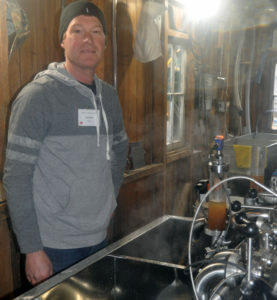 A mix of snow and rain last weekend couldn’t put a damper on Maple in the County celebrations for producers who have experienced a great year at the taps. 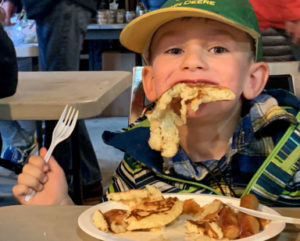 Amid a downpour and a mucky mess Saturday morning, the county’s largest producer, Fosterholm Farms was still out of seats for its unlimited syrup breakfast. As volunteers were dishing out heaps of pancakes cooked from his grandmother’s secret recipe, Dean Foster was licking his lips next door as he considered both the haul from his 7,800 taps and the crowds their liquid gold attracted. “It started out slow, but it’s been pretty good today,” Foster said. Traditionally, he said his crews only boil sap once a day, but they’ve been kept on their feet boiling and cleaning repeatedly. With an evaporator that processes 210-230 L an hour, staff haven’t been able to keep up with bottling. The syrup coming out has been up to his standard, too. “The quality is right at the top. We haven’t made anything but the highest grades.” He expects some darker sap to come as the trees warm up, but there will come a time when the season has run its course. Fortunately, that hasn’t appeared yet. Foster added eventually the sap becomes bitter and the syrup unsaleable. Discovering when that happens is a bit of a trick of the trade, somewhat like that pancake recipe. Foster tells visitors that each sugar bush has its own distinct flavour and that his syrup is different than even cousin Todd Vader across East Lake, whose family is also a mainstay in the industry. With the miserable weather, however, it was a good time to show off advancements in technology. Foster was touting a new woodlot monitoring system, Datacert by Lapierre, which he installed this year. He and his staff now have a map of their entire woodlot on their phones. The technology gives them a reading fo each of their 800 main vacuum lines and temperature readings. It gives them real-time updates on when there might be blockages or freezing. “What we’ve done is go from three guys walking 110 acres all day long to having two guys pinpoint where they’re going to go,” he said. Some visitors, like Linda Guthrie, who brought 11 friends from across Ontario out to sample the Maple in the County fare enjoyed engaging with producers and asking questions. She said she enjoys hosting people for events like Maple, Countylicious, and parades. 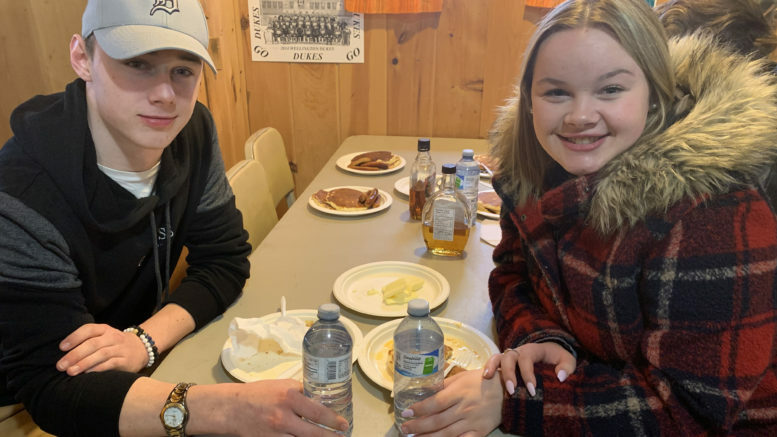 Others, like lifelong county residents Cody-Rae Fowler and Zack Empey, came for the syrup. “This is always on our list, and Nyman’s, which is right behind my house. We go to the ones that are close. We come for the syrup, but everyone’s friendly here too. Seeing everyone having a good time is always nice. This makes us feel like we’re part of the county when we’re coming out,” Fowler said. While Foster said he’s proud of the reputation his pancake breakfast has, the syrup is the focus. An added twist this year was collection jars for PECI student Abby Heffernan as she battles another bout with cancer. Foster said her story hits close to home as she worked for Fosterholm Farms and was one of the hardest-working students he’s ever had in his employ. Guthrie and her crew made their way from Fosterholm Farms to Vader’s as they followed a recommendation to try some of the fresh-popped kettle corn. Once inside the sugar shack, one could smell that sweet smell Foster mentioned as there was syrup production in process. Todd Vader echoed the sentiments that it had been a strong season thus far. He, too, was touting some technological improvements as a faster reverse osmosis system was speeding up his processing time — a revelation in a busy year like this. “I’m really happy with it, it means I can stay an extra hour in bed,” he said. That’s a good thing because sales of his varieties, including a whiskey barrel-aged syrup, were moving briskly. His father, Arnold Vader, who took over the family business from his own father, Amos, who moved to the East Lake shore in 1910 from Coe Hill, gave a little smile at that fact as he paused from sharing a wealth of stories. On another shore, off the Hayward Long Reach, Phil Roblin was a bit disappointed Sunday that rain, then snow successively may have discouraged travellers on his biggest weekend. Still, he said joining the driving tour three years ago was one of the best moves he and wife Brittany made. Past a yard where children visited with their hobby cows and people smelled the aroma of a bonfire, the Roblins had an army of family to sell their products and offer maple pulled pork to those who made the journey. While food and hospitality were well received, the big draw was the chance to talk to a well-invested producer. Roblin started dabbling in maple syrup when he as eight years old and now he taps 1,100 trees. He was clearly in his element talking about the business. The messy weather didn’t stop families from visiting the Three Dog Winery sugarbush on Sunday either. 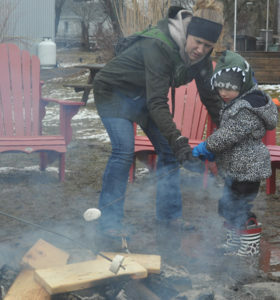 A steady stream of visitors trudged through the mud to the sugarhouse and some found themselves falling or stuck as they roasted maple marshmallows by the fire. That was one of the stops Michelle Julian visited with her military family from Saskatchewan that was recently posted to CFB Trenton. She said Maple in the County offered a great starting point to explore the riches the rural area has to offer.